In comparison to a similar subscription-based 2000 question offering from USMLEWorld, Kaplan’s Qbank is slightly more expensive. But Kaplan’s Qbank does have added value in the form of the iPhone app. However, there are significantly cheaper options available for medical students with tighter budgets. For example, First Aid Q&A for USMLE Step 1 from Modality is an app with 986 test preparation questions available for $44.99, a fraction of the Kaplan Qbank. Though the Mobile Qbank app is an innovative idea, it does leaves much to be desired in regards to seamless syncing of user progress. However, the majority of users will most likely be happy with the app’s added value to their Qbank subscription — something not offered by competitors. Aside from seamless syncing issues, the Kaplan mobile Qbank app is a good mobile version of the desktop application, with most of the functionality appropriately scaled down. If you’re in the market for a USMLE preparation tool and you use your mobile device a significant amount, definitely consider the added functionality the Mobile Qbank iPhone app brings to table. 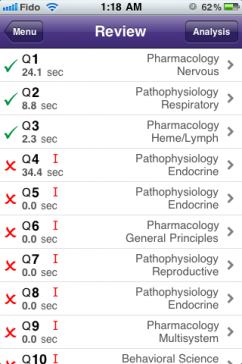 If you can’t imagine doing USMLE Step questions on your iPhone, then you have more options. Either way, the Kaplan Qbank still offers high quality USMLE questions via the desktop app alone. If you’re looking for a Qbank lighter on the wallet, and made just for your iPhone, there are other options available in the App Store for a fraction of the price. * No customized iPad app! Scaling an iPhone app to an iPad’s screen is not difficult at all for developers to do. It’s puzzling why Kaplan has not done this. As the app stands, you have to manually scale the screen of the app on the iPad, causing the text to be pixilated (refer to included iPad pictures). Even if studying on your phone isn’t for you, Kaplan still has a high quality question bank that deserves consideration when choosing a USMLE preparation resource. However, If you’re on a tight budget, other options are available. Darwin Wan, B.Sc(Kin) is a second year medical student at the University of Alberta, and currently servies as the Information Technology Officer for the student body.